Buying your land can be the first step to building your own home. However, you want to invest in a land that is void from problems and one that you can easily sell if you change your mind. 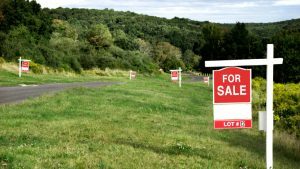 Here are some areas to consider when buying land. What is the zoning on the property? – It is important to understand what can be built on the property. Start off by making a call to your local planning and zoning department and asking for more information on the property you intend on buying. Ask for the zoning classification and for some examples of what type of property will be allowed on these particular zoning classifications. What is the landscape of the property? – Understanding the landscape of the property will help you identify any unpredictable elevations, cliffs, mountains, valleys, ravines and more. These features can have an impact on the build-ability of the property. The best way to look at your property is to view it on Google Earth. Start by downloading the software and then zoom-in using your mouse and the keyboard. What is the annual tax obligation? – If you are not building on your property for some time is it a good idea to understand how much you will have to pay as tax. Look for a reasonable tax bill which ranges from 1% – 4% of the property’s full market value. What public utilities are available? – Look at what public utilities (Water, Sewer, Electric, Gas, Phone) are available to your property as not having access to certain utilities will make it difficult to build on your property.